London, World Travel Market (United Kingdom) – November 9, 2018 (travelindex.com) – The UNWTO/WTM Ministers’ Summit, held yesterday by World Travel Market and the World Tourism Organization (UNWTO), was well received by participants from government and the private sector for its more dynamic new format leading to more concrete takeaways around this year’s theme: Investment in Tourism Technology. This year, the UNWTO/WTM Ministers’ Summit held at World Travel Market, one of the world’s biggest tourism trade show (6 November 2018), focused on investment in tourism technology with a novel format. For the first time the summit featured a panel of private sector leaders alongside a panel of ministers, sparking an open and useful exchange of ideas and opinions on how to channel private capital into innovative tourism technologies. This meant that tourism ministers and high-level representatives from countries including Bahrain, Bulgaria, Egypt, Italy, Malaysia, Mexico, Portugal, Romania, South Africa, Uganda, Uruguay and the UK were able to directly reflect on and respond to the opinions voiced by the leading tourism and technology investment funds involved in the panel, such as Alibaba Capital Partners, Atomico and Vynn Capital. “Without the support of the key tourism stakeholders, notably governments, corporations and investors, development and implementation of innovative products is not possible. Today’s discussions shed light on the influential role of both sectors as well as the need for stronger public-private partnerships”, said UNWTO Deputy Secretary-General Jaime Cabal opening the event. A common sentiment amongst the panel of private sector entrepreneurs was that disruption leads change in the tourism sector, but regulation can be preventative to obtaining the attractive investment conditions needed to support disruptive new business ventures. It was suggested that regulation should be fixed in order to give clear guidelines to investors who wish to put private capital into new technology. Several technology investors highlighted the need to narrow the opportunity cost and clear up the governance barriers for innovation in tourism. “It needs to be easy for start-ups to grow and expand – if rules change too quickly, investors will hesitate to invest,” Katherine Grass of Thayer Ventures told ministers. Lio Chen, Managing Director at the Travel & Hospitality Center of Innovation at venture capital firm Plug and Play, called for larger technology companies to engage with start-ups to boost ideas, human resources and investment. “I ask ministers to incentivize the top five corporations in their country to work with start-ups and foster innovation,” he said. On the subject of regulation, Michael Ellis, UK Parliamentary Under-Secretary of State for Arts, Heritage and Tourism, said: “It’s a question of balance, and it’s a challenge to get that right, especially in technology.” He also urged ministers to boost sustainability and help tackle the world’s climate-related problems, such as rising carbon emissions. Education was also highlighted as an element making investments more attractive. “Education allows technology to root into societies and contribute to making tourism more inclusive for communities,” said Benjamin Liberoff, Vice-Minister of Tourism of Uruguay. “We have brought the public and private sector together in a unique format, and hope it will deliver real change in the sector. As tourism grows, then technology will play a key role,” said Simon Press, Senior Exhibitions Director of WTM London. 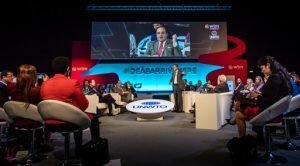 Moderated by Richard Quest of CNN International, the summit contributed to UNWTO’s ongoing priority to place tourism at the centre of the global innovation agenda.